This is my favorite salad (until I have a new favorite, of course 😉 ). 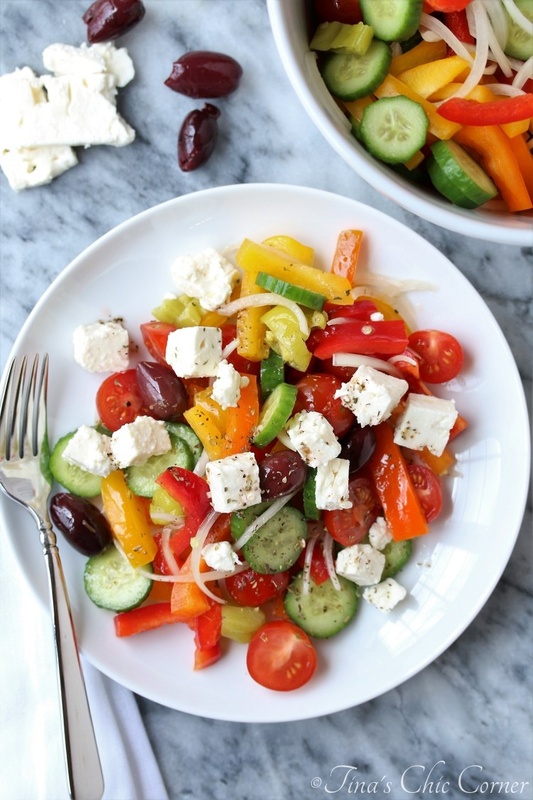 I was craving Greek salad the other day. Yes, craving a salad sounds weird, especially because I crave foods like bagels and pizza on a regular basis. You better believe that I’m going to take advantage of this healthy craving while it lasts. 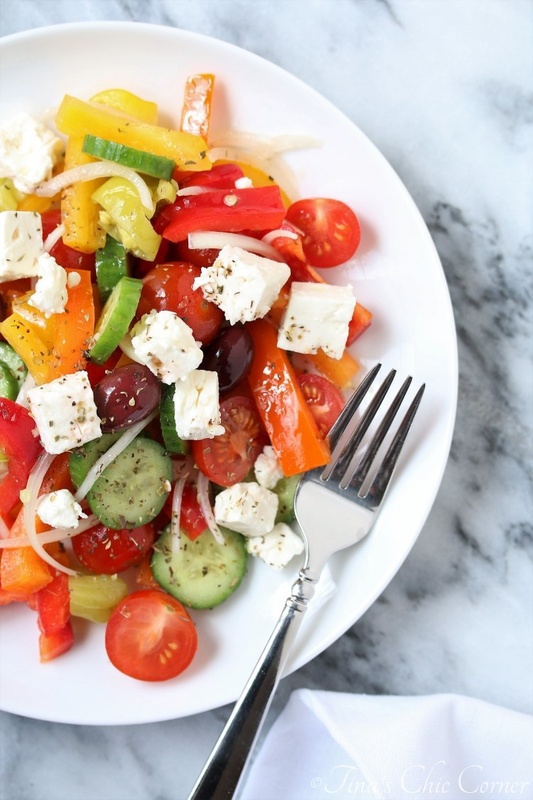 I love a traditional Greek salad made with tomatoes, cucumbers and feta cheese, but I wanted to kick it up a notch. I still kept this salad lettuce free, but I added a bunch of other colorful veggies like Kalamata olives, and pepperoncini peppers. Remember when I told you the other day that I was obsessed with pepperoncini peppers? Clearly, I’m still obsessed with them. A vinaigrette dressing is really the only way to go with this salad. Usually I make an olive oil and lemon juice vinaigrette with herbs. It’s super delicious and it takes the guess work out of how much vinegar to use. For some reason I have a hard time getting the vinegar to oil ratio correct. If there is too much vinegar then it will ruin a salad. On the flip side, if there is not enough vinegar then it’s weird and slippery. By some miracle, today’s vinaigrette is spot on. I finally got the ratio correct! By the way, there is no shame in using a store bought bottle of vinaigrette to save time. There are plenty of times that I don’t feel like making homemade dressing and happily use my favorite brand from the store. I’ve eaten this salad for the past 4 days in a row and there are no signs of me getting bored of it. That says a lot because I tend to have a short attention span with food (unless it’s pizza or bagels, of course). 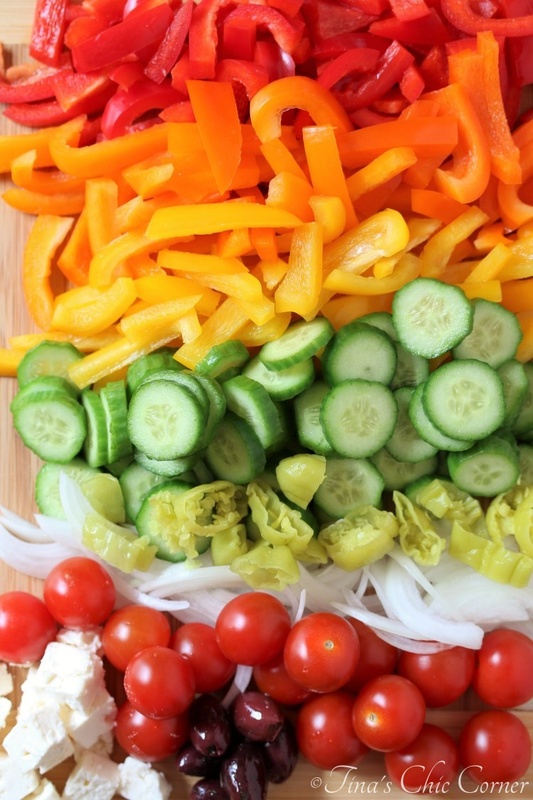 It’s colorful, it’s delicious, and it’s easy. There are countless ways to enjoy this salad. It’s amazing on its own, add meat and carbs of almost any variety, add beans for a vegetarian flair, or add eggs for breakfast. In a small bowl, whisk together the red wine vinegar, oil, oregano, salt, and pepper. 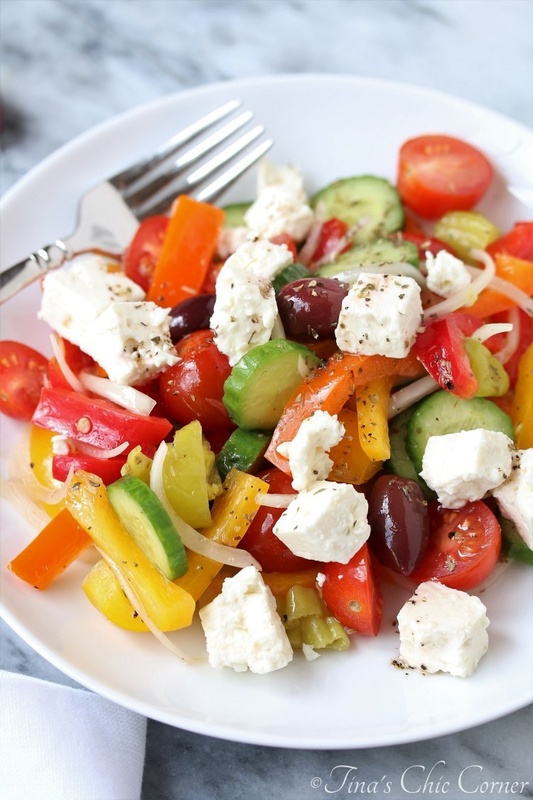 In a big bowl, add the bell peppers, onion, cucumbers, tomatoes, pepperoncini pepper, and olives. Top it with feta cheese.